My sister was born five minutes before me, a fact she loved to hang over my head our entire childhood; she was older than me and therefore I was the baby of the family. Yes, we are twins, the most similar looking fraternal twins I’ve ever seen. We are not identical, but our appearance, personality and mannerisms leave no room to deny- we shared a womb! So you see, I’ve never known what it’s like to not have a sister. Every memory, she was there; wrestling me as a baby, bickering with me in childhood, fighting over clothes in middle school, getting in trouble together in high school, and finally: “adulting” together in adulthood. Having a sister since my first breath is a blessing that has made me comfortable walking alongside other women in Christian friendship. After being “born again” with a new life wrapped up in Jesus, my sisterhood expanded. I was hungry for deep fellowship with other women who were on the same road with the Lord that I was on. I needed to know I wasn’t alone; that this Christian life can be hard for everyone. I joined a small group of ladies from my church and dove in to the Word with them. I laid my doubts and struggles bare before them and was assured I wasn’t alone as they shared theirs with me as well. Since then, I have treasured my sisters in Christ as we’ve been there for each other through babies, job changes, health concerns, and just following Jesus out onto rocky waters for his kingdom. It hasn’t always been the same group of women. It’s been ladies that the Lord has placed in my path here and there on different journeys I’ve been on. Maybe it’s different for you, and it’s been the same handful of girlfriends for a while. One thing we can be sure of: God wants you to encourage the “sisters” surrounding you right now. We are sisters as believers because “Jesus is the firstborn among many brothers and sisters” (Romans 8:29). He set the bar high to love our siblings in God’s family self-sacrifically, didn’t he? As members of the same family, we are called to love one another in a way that screams to the world we are different. This love can only be cultivated by the Holy Spirit. 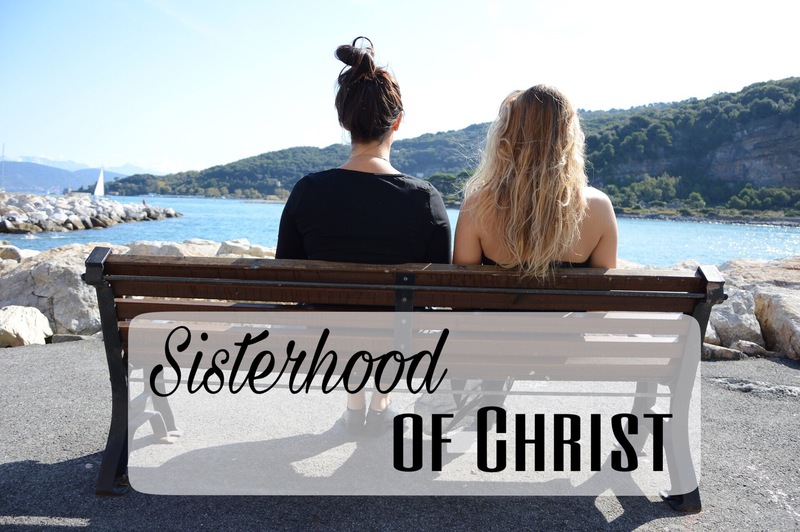 So what is “The Sisterhood of Christ” founded on? Sisters in Christ are knit together for life with his love. It’s not self- serving, it’s kingdom edifying. Friendship woven in Christ is held together by a desire to see his kingdom advanced in and through your friends. Seasons may come and go where we aren’t seeing each other face to face and God has us on different assignments, but we rejoice when we hear about what God is doing in our sisters. We will always have a common bond that keeps us cheering them on and ready to have their back in prayer or any other way if needed. Sisters in Christ call each other “UP.” We don’t call each other out in a self righteous way. When we see a friend not living the grace and truth of God’s Word, we care. We care enough to call them and remind them of their treasured place in God’s family. As sisters, we desire to see them live up to their full potential in God’s power. Sisters in Christ cheer instead of compare. We know that we all have an important job in the family and that we need each other’s gifts. Sometimes, we do get mesmerized by each other’s talents and forget about our own; but not for long. We realize jealousy is sneaking in through that enemy of ours, and we crush it by cheering on our sister. Continuing to compare ourselves to each other would cause our whole family to suffer, and there’s way to much at stake to let that happen. So link arms, sisters. We are so much stronger and better together. Your family is waiting for your sisterhood in Christ to shine, and so is the world. Love this. I just asked a group of ladies to get together once a week for just these reasons. To cheer each other on and walk together through good times and bad. I love this! I am one of 4 girls, so I totally get where you are coming from. I recently joined a Mom’s Bible study and it is the best thing ever too! Love this! Sisters cheer instead of compare – I love that! We definitely need more of that (as well as calling each other UP when need be too.) Hoping for more of these “sisters” in my life. Love this. True Christian friendship is something to be treasured and is worth searching for! I totally agree with your sentiments…it’s so important to have that Christian sisterhood and build community. I never had a sister growing up, but I have been blessed to have a good circle of Christian girl friends whom i just love and cherish!